Your landscaping design consultation begins with a visit from one of our seasoned and experienced estimators. They will assess your property and provide recommendations for how to best design and implement your landscaping needs based on your properties’ characteristics. While keeping in mind Northern Nevada’s unique weather patterns and local implanted shrubs and trees. We proudly provide service in Reno and Sparks, NV and surrounding areas. Our expert designers will provide comprehensive plans based on your unique specifications. We work with you to provide detailed drawings and plans for your landscape. If you have ideas, we would love to hear them and help you implement them into your outdoor space. From arrangements of simple flowerbeds and beautiful shrubs to multi-tier vegetable gardens to eye-catching raised structures, we will build you the most appealing and efficient planters for your space. Whether it’s a new installation or a refreshing addition to an existing arrangement, we can provide countless decorative rock and bark solutions. Our creative rock and bark options will help you create a weed-free landscape that is both low maintenance and water-smart. Our large variety of rock and bark allows us to find options that match your existing space’s surroundings. Installation of new sprinkler systems and drip systems as well as extending existing systems. Upon review of your old system, we may be able to offer upgrades to improve its efficiency, implement new components, make needed repairs and correct pressure issues. 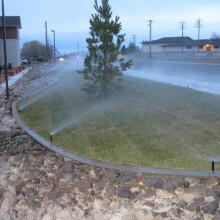 By always using the newest equipment and technology, we can ensure the reduction of water runoff and save you money. 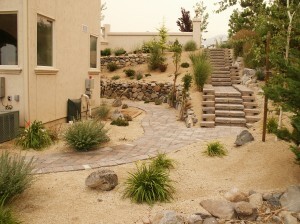 A well-designed dry creek can enhance your landscape’s natural look and improve drainage. Our attractive dry creek beds can be functional or purely aesthetic; it all depends on your preferences and landscape needs. Quickly becoming one of the most versatile paving products available, patio pavers come in a wide variety of sizes, shapes, colors and designs to complement your landscape. As certified paver installers, can build you an attractive, slip-resistant yard boarder, walkway, dining area, deck or any other hardscape. If installed properly, pavers can last three times longer than concrete; the key is solid foundation. Often used to terrace landscapes, create planters or establish attractive fire pits, retaining walls are a decorative and functional landscaping option with countless possibilities. Experienced in erecting both free-stacked and fixed walls, understands how to build retaining walls with the greatest functionality. While also ideal for level landscapes, retaining walls can be a major asset in erosion control for sloped spaces. 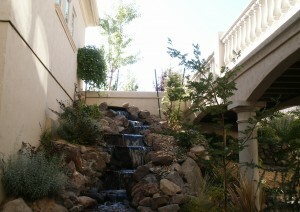 At Action Lawn, we create custom, decorative ponds and waterfalls to create lively, dynamic landscapes. 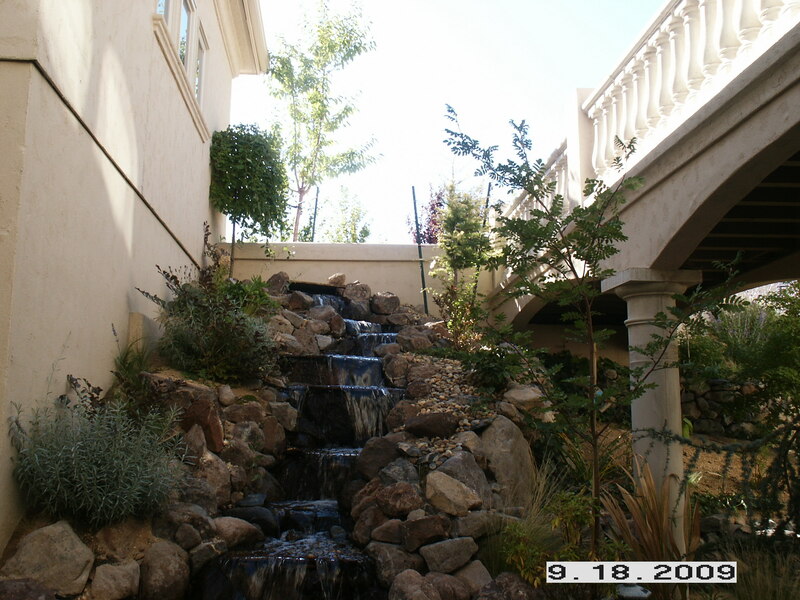 We custom design each pond and waterfall with a variety of features to accent your yard and provide natural sound and movement. From infinity edges to splashing fountains to natural rock seating, we are experienced in designing and building intricate waterscapes. Vegetation is a cornerstone to creating compelling landscapes. Whether your yard is bare, sparse or in need of a makeover, can recommend the kind of trees, plants, shrubs and flowers that will make the best use of your yard space. When planting, we use only the best Triple mix soil to ensure healthy plant growth. Keeping factors in mind such as length of seasons, water consumption and growth potential, we can create landscapes that are both efficient and enjoyable.